This cordless compound microscope and digital camera combination includes a 100x oil immersion lens (for 1000x viewing), 1.25 N.A Abbe condenser, and a rechargeable LED illumination system. 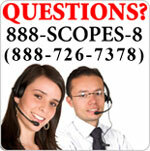 The quality digital camera and the included Motic® Images software is both Mac and PC compatible (Win7 and higher). WF 10x eyepiece with pointer. Will accept 21mm diameter reticle (requires 19mm retaining c-ring). Objectives are DIN standard: 4x (0.10 N.A. ), 10x (.25 N.A. ), 40xR (0.65 N.A. ), 100xR oil immersion (1.25 N.A.). Built-in, 1.3 meg digital output camera. View live 1280x1024 pixel image on computer screen and take snapshots! 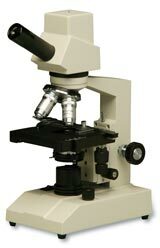 The BB-02500 compound microscope with digital camera, is a versatile microscope that provides magnification up to 1000x. Add to that the Motic Images software package that provides multiple image manipulation features, 1.25 N.A. Abbe condenser, and a rechargeable LED illumination system, you have a useful digital microscope at an affordable price!